I first adopted my K. Blossfeldiana about a year ago from a friend of mine. When I got it, the flowers had all wilted and were falling off. Since then, it only blossomed around 2 or 3 flowers (single flowers, not bunches). Moreover, the bigger leaves fell off and new leaves never grew to the same size. Still, it never stopped growing more stems and leaves and is much larger now than it was when I first got it. 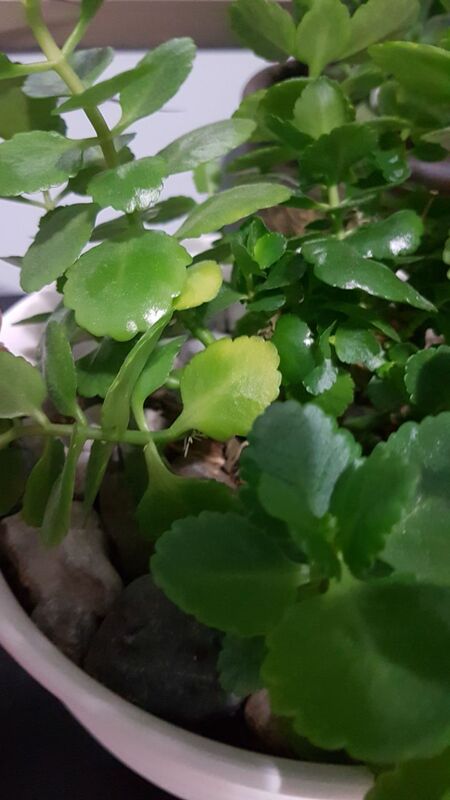 What worries me about it is that some of the leaves are yellowing and that some of the leaves curl inward towards the stem. The yellowing leaves aren't crispy, but soft. I expect this is due to overwatering, so I'm not overly worried about it. I've reduced my waterings since then. At times, the leaves will bend downwards from their base at the stem. The leaves themselves will look fine, but they won't be perpendicular to the stem. Is that normal? If not, any comment on what the cause could be is greatly appreciated. Finally, the tallest stem is somewhat flimsy and is leaning to the side. Is it normal for it not to hold its form? There probably isn't much wrong but I am somewhat of a doting plant owner and want to make sure my plant is doing fine. 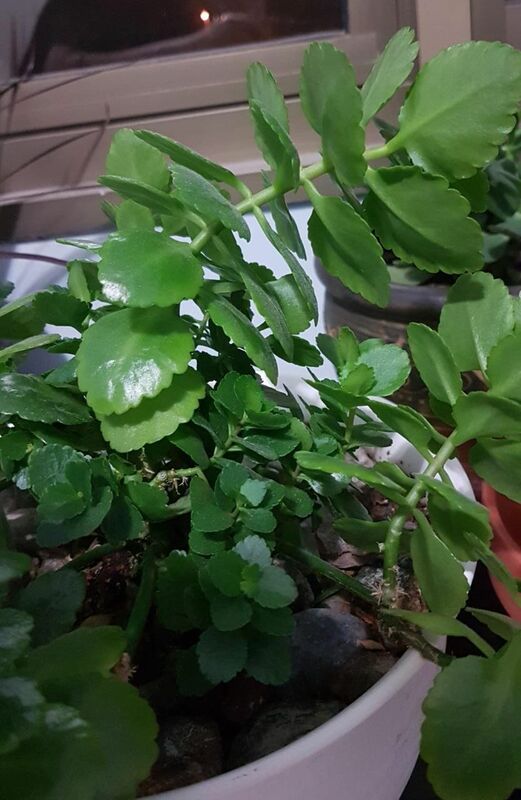 There are pictures of the plant linked below. Thanks in advance! By no means am I an expert, but this is my 2 cents. First of all do not worry about the healthy, green leaves bending inwards/down at times, they probably only do it in the evenings right? They do it since the plant needs rest and since in the night it can't do photosynthesis anyways, so it lets it's leaves droop. the plant is "sleeping". Now about the yellowing leaves, since you say they aren't crispy it's most likely an over watering problem as you said. it is always better to under water than to over water. 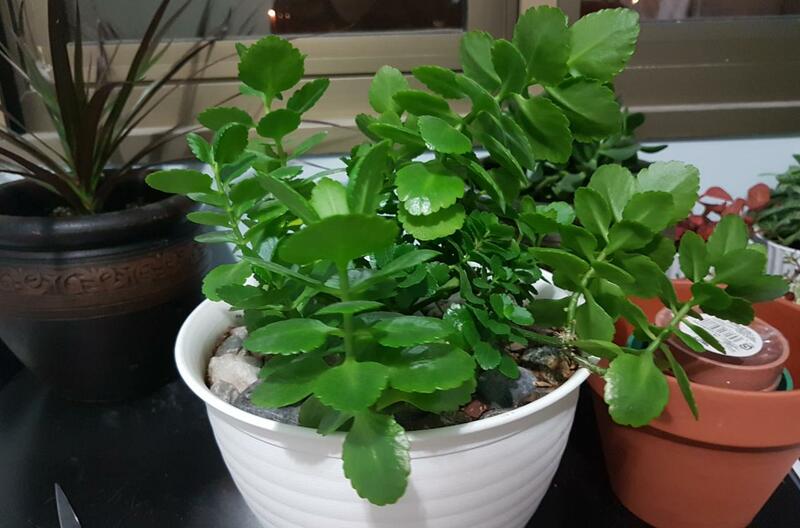 I used to have a Kalanchoe myself, unfortunately it died due to root-rot since it was over watered d. Here is a series of events that occurred which lead to the plants death, If yours starts showing these symptoms it's probably too late. All of the above happened because to roots of the plant were destroyed due to overwatering, so even if the plant was thoroughly watered it wouldn't be able to take in water and eventually dry out. In conclusion your plant is probably fine, just look at all the healthy stems/leaves. I'd recommend you reduce watering and make sure the soil is completely dry between watering. 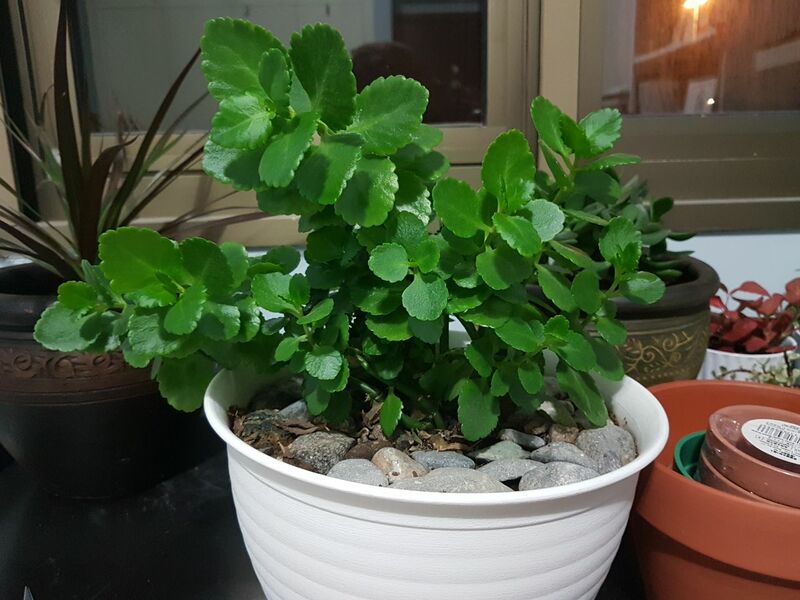 Your Kalanchoe looks completely fine to me, albeit some of the stems are a bit too long (the distance between the leaves is too big) indicating the need for more light (they should always be in a well-lit place of a house or an apartment). The fact that the leaves are too small is indicative of a lack of nutrients. Once all the flowers fall of it's pretty tricky to re-induce the flowering. To do that it'll need a steady supply of potassium (ions) for several weeks. In order to achieve that I usually push in a couple fertilizer sticks into the plant's soil and then water them every 1-2 weeks with a liquid fertilizer solution as an added measure too. This is the only way I'm aware of that can induce flowering in Kalanchoes (nothings else has helped, not even regular doses of potassium sulfate that have given me spectacular results with chilies and strawberries). Not the answer you're looking for? Browse other questions tagged houseplants plant-health plant-care or ask your own question. My orchid has one yellowing leaf. What's gone wrong? Lucky Bamboo stem sags but seems healthy, how do I fix this? What's Wrong with this Orchid? Why is my lucky bamboo turning yellow? Does my cyclamen need to go dormant? What are these brown stains on my Bougainvillea's leaves? What's wrong with this Pilea Pepermoides?